GoProposal integration will share contact data and automatically trigger your chosen workflows when a proposal is accepted. By integrating GoProposal with Karbon you can share contact data between the two apps, and automatically trigger the your chosen workflows when a client proposal is accepted. This guide will walk you through the steps to connect your GoProposal account to Karbon. Before you can make use of this integration you need to complete your setup in each application. In GoProposal, create line items for each of the services that can be part of a proposal. In Karbon, create work templates for service offerings that can be part of an engagement. Link GoProposal and Karbon together using a token. You can find your token in Karbon by going to Settings > Connected apps > GoProposal. Click Manage and copy the connection token that appears. Paste this token into GoProposal by going to Settings > Integrations > Karbon. Associate a Karbon work template to each line item in GoProposal. Go to Configure > Line Items and Edit each line. Select the appropriate template from the Karbon work template section. Create a proposal in GoProposal from scratch or using a package template. Fill out the details, select the services you are offering, get the calculation, and select Complete Proposal. To initiate the Karbon integration with GoProposal, the line items chosen in the scratch proposal option must be mapped to associated Karbon work templates. Likewise, if a package template is used, that package template must be mapped to work templates as well. In Your/Client Details, assign the person who will be sent the proposal from the Karbon list of clients using the “Find a contact from Karbon" field. Just start typing the person or organization you are looking for, and GoProposal will provide you all records that match. If this is for a new contact, complete the "or add a new contact to Karbon" section that is provided. With the prospective client associated correctly in Karbon and GoProposal (or a new contact specified), and the proposal line items and Karbon work templates already associated on initial setup, GoProposal will trigger everything automatically. When your proposal is marked as “Won”, GoProposal will trigger Karbon to create the work and populate all the details from the associated work templates. To create work for an organization, be sure to select a contact record that is associated to an organization. 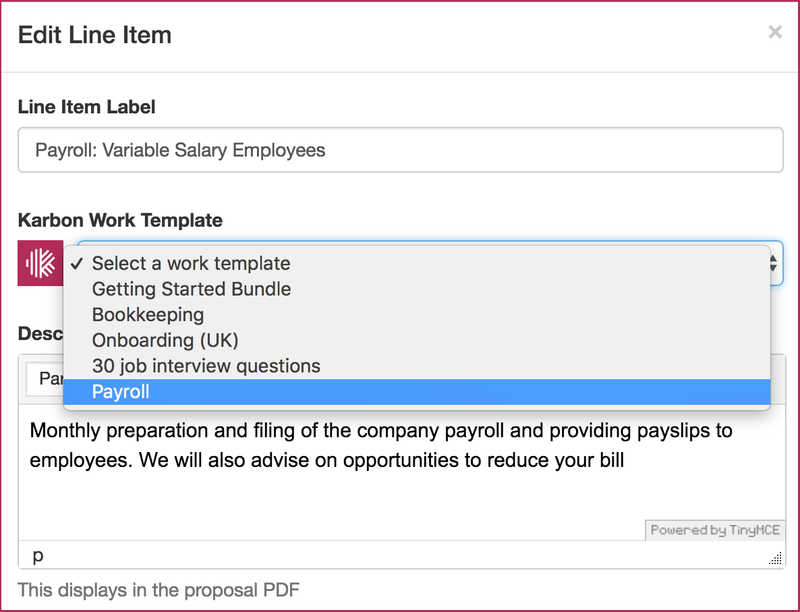 Or, if you are creating a new contact, make sure you complete the Company Name field to denote that the proposal is for work to be completed for the organization, and not an individual. To create work for an individual (person), be sure to select a contact record that is not associated to an organization. Or, if creating a new contact, make sure you leave the Company Name field blank to ensure the work is associated only to an individual. You can create multiple pieces of work in Karbon from one proposal, through two methods: line items and package templates. If creating a proposal from scratch and choosing individual line items to include in a proposal, any line item mapped to a Karbon work template will have the work created when that proposal is marked as won. Therefore, if you want to create multiple pieces of work, you need to select multiple line items that are mapped to Karbon work templates (since they are a 1:1 mapped relationship). If your are looking to create a set of work items based on your firm's delivery of baseline or packaged services, then utilize GoProposal package templates. Create a package template for the proposed collective body of work (e.g. onboarding and client training), and map all the related work templates to that package template. When the proposal is won, GoProposal will create the associated work from the collectively identified work templates mapped to the package template. If you change any contact information for a Karbon contact in GoProposal, these changes will not be reflected in Karbon. GoProposal, at this time, does not have the ability to overwrite the details of a pre-existing contact in Karbon. If you need help with GoProposal, you can reach out to [email protected] for assistance. Can I update my Karbon contacts when creating a proposal in GoProposal? Can I map multiple work templates to a single line item in GoProposal? When GoProposal creates Karbon work items, what other related information is created?